Roasted leg of lamb is a perfect dish for any special occasion. Photo: Getty Images. By tradition, both religious holidays share a couple common foods, lamb and the egg. Passover Seder plates hold both (in the form of a shank bone, commonly of lamb, and a boiled egg) and many Christian families roast a leg of lamb for their Easter dinner after the Easter egg hunt. 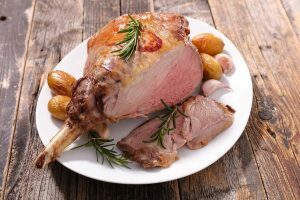 The recipe here is for a roast leg of lamb, a preparation that my brother, Marc, and I have made many dozens of times over the years for dinner on Sundays, including some Easter Sundays. This month is a good opportunity to consider the nexus of food and religion. Food feeds many hungers, one of which is hunger for the sacred. In many religious traditions — certainly both the Christian and the Jewish — many food rites make meaning, mark special occasions, and provide identity. This recipe for the St. John gigot, first learned from Marc, and then tinkered upon by me, is itself a quasi-religious event for us. We do not roast it merely to have lamb for dinner. We roasted it those many Sundays — Easter Sunday included and, I dare guess, quite a few Passover evenings — because on Sundays the gigot becomes the place where we join in that shared meaning of what is truly important in life, how we can make holy or transcendent those everyday things such as cooking or eating or being at table, of being together as two brothers (often, of course, our families with us). Perhaps this is the some of the meaning of the freedom or liberation extolled in the Passover Haggadah, or of the renewed life promised in the Resurrection. Whatever it is, it is more than just a gigot. Here also, a note or two on wine, specifically for this meal for which many of us pair our lamb with special wines. Rich, full-on, tannic, deeply colored reds are the right pairing for roast lamb. Lamb is such a “sweet,” fully flavored red meat, generally high in fat, that its best match for the palate is a wine that mollifies that fat and pairs up with that richness. That is, a big red. When consumed together, red wine’s tannins erase the oleaginous impression of fat, while fat softens the astringent grip of tannin. They literally pop each other down—a happy thing. Finally, for dessert, a wine match for Peeps, the baleful, straight-staring, chick-shaped “marshmallow product” so sweet that they set the teeth to quailing. Peeps are a sort of foam made of sugar, corn syrup and gelatin, then speckled with more sugar. They are a burp wrapped in sandpaper. As a dessert, their only wine match can be that which is as sweet as they: a late harvest wine, to be sure, perhaps a so-called “ice wine.” Most cool-climate winemaking regions on the globe produce such dessert wines, especially from the riesling grape. However, they’re even better with jellybeans. Preheat the oven to 400 degrees. Rinse and dry the lamb. Slice away any egregious blobs of fat, but do not remove all visible fat (while roasting, a modicum of melting fat adds a lot of flavor). Make 6-10 slits into the meat of the leg, about an inch in both length and depth. Make a paste of all the remaining ingredients and slather the leg all over, pushing bits of the paste deep into the slits. Place the leg in a shallow roasting or baking pan (if you have a low rack for the pan, use it) and pour 1/2 cup water or white wine around the leg. Place in the oven and roast for 10 minutes, then lower the heat to 300 and continue roasting until an instant-read thermometer inserted into the thick of the meat (do not touch bone) registers 125 degrees for medium-rare (about 15-20 minutes per pound depending on your oven and the temperature of the lamb when first put into the oven). Place the leg on a cutting board and let it rest; “carryover cooking” will increase the temperature to about 130 degrees or true medium-rare. You may prefer the lamb cooked through and meltingly tender. In that case, lower the long roasting time temperature to 250 degrees and cook until the internal temperature registers 140 degrees (a half hour or more per pound), then let the lamb rest another 15 minutes on the cutting board. In either case, the juices surrounding the leg serve as a sauce for the slices, or you may strain and then reduce them for a glaze.